Representatives of the Office of Performance Evaluation presented findings from their audit of the transportation department to members of the Joint Legislative Oversight Committee Monday. The comprehensive review focused on department revenue, performance measures, the need for financial, highway and bridge management systems and GARVEE funding. Idaho Transportation Board chairman Darrell V Manning and ITD Director Pamela Lowe agreed with conclusions of the Office of Performance Evaluation’s audit. “The audit principally validates the strategic direction of the department for the past two years,” according to the department’s formal response. As Eleanor Roosevelt rightly observed, recognition of human rights begins "close to home." Idahoans can boast of a particularly strong record of working to establish and uphold human rights close to home. Idaho's human rights' history can be traced to 1896 when it granted women voting rights, the fourth state in the Union to act on Women's Suffrage. Eighteen years later, Moses Alexander became the governor of Idaho, and the first Jewish governor in the nation. Mr. Speaker, Mr. President, Mr. Pro Tem, honorable members of the Legislature, Mr. Chief Justice and distinguished members of the Judiciary, my fellow Constitutional Officers, First Lady Lori, my family, and my fellow Idahoans. Before I begin, let me recognize our NEW lieutenant governor, Brad Little. Congratulations Brad, and good luck. Thank you for being here today, for the second and probably the last time that this State of the State address will be delivered at Boise State University’s Special Events Center. Gov. C.L. “Butch” Otter last week outlined an austere budget that reflects the declining national economy and Idaho’s constitutional mandate to operate with a balanced budget. In addition to the reductions he requested, the governor’s budget message also included his vision for addressing the backlog of transportation needs. He recommended incremental increases in the Idaho fuel tax, vehicle registration costs and introduced the concept of a new tax on automobile rentals. The Idaho Transportation Board will be asked to dip into its unallocated fund this week to cover the costs of emergency repairs to bridge girders damaged recently by an over-height load east of Twin Falls. A westbound driver hauling heavy equipment apparently failed to lower part of the machinery, causing it to strike the 500 West Road Overpass near Burley on Jan. 9. By the time the snow begins to fall at the start of a major winter storm, ITD crews already have applied deicer to many of the state’s main highways. What kind or amount depends on the district, but only one man and his team of chemists and technicians test the products for the entire state to ensure the quality of the materials remains consistent. Ron Wright is an internationally acclaimed chemist who has spent the last 20 at the helm of ITD’s materials and chemistry lab at Headquarters. As we look back over the past year as usual it was a mixed bag of experiences. Central to those experiences was the greatest resource that the department has – our employees. One important thing to remember is that a great foundation was established by those that were here before us and we have a great responsibility to maintain and improve that legacy. District 6 Engineer Blake Rindlisbacher and Assistant District 6 Engineer Karen Hiatt presented service and safety awards to employees at the employee benefit luncheon on Oct. 29 in Idaho Falls, held at the Chuck-a-Rama Buffet. Service awards were for the last six months of 2008, and safety awards were for all of 2008. As you are all most likely aware by now, MPC computers announce recently that it has ceased all business operations. The impact of this is that there will be no sales, support or service available from MPC. ITD has a significant installed base of MPC laptops and PCs. Many of these machines were still under a maintenance and/or warranty agreement with MPC. Unfortunately, these maintenance and warranty agreements will not be honored by MPC. The Idaho State Police are proud to support and participate in the 2009 Final Leg Torch Run through Idaho prior to the opening of the 2009 Special Olympics World Winter Games. The Flame of Hope will be arriving from Greece at the Third Street boat launch in Couer d'Alene on Jan. 29 at 8:30 a.m. A ceremony will follow the arrival at the Coeur d'Alene Library. Barry O. Bragg, 65, passed away Saturday, Nov. 29, 2008, at his home of an apparent heart attack. He worked for the Idaho Transportation Department for 26 years, retiring July 1, 2004. The bad elf had issues with the microphone and Santa forgot his eight tiny reindeer, but the food and fun made for a memorable 2008 Christmas party. 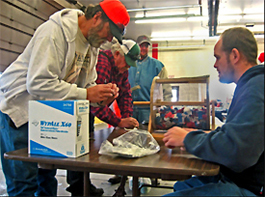 The raffle and auction raised about $3,000, which allowed two donations of $1,350 to two local charities, Interfaith Volunteer Caregiver’s of Twin Falls and The Helping Hands Mission in Burley. The ITD Twilight Golf League Committee is starting to get organized for the 2009 season. The league will play at Shadow Valley again (along Idaho 55) on Mondays. It is too early to know what time we will tee off, as it partly depends on the number of teams on the league, but we generally tee off between 4:45 and 5:45 p.m.
Gov. C.L. “Butch” Otter appointed state Sen. Brad Little of Emmett to become Idaho’s new lieutenant governor today. The appointment was effective immediately but is subject to confirmation by the Idaho Senate. Little, who was elected in November to his fifth term in the Idaho Senate, succeeds Jim Risch, who resigned as lieutenant governor today after being elected to the United States Senate in November. Two new special Idaho license plates, approved by the 2008 Legislature, went on sale statewide Jan. 2. Proceeds from sales of the special plates will benefit programs of the Natural Resources Education Outreach Network and the Idaho Rangeland Resource Commission. The plates are available at county licensing offices throughout the state. U.S. Highway 12 between Lowell and Powell was reopened Wednesday afternoon following successful avalanche mitigation efforts in the narrow Lochsa River corridor near Lolo Pass. The only route between Lewiston and Missoula, Mont., closed Tuesday afternoon between mileposts 99 and 160 to allow ITD experts to assess the potential for avalanches and to try preemptive measures to control snow slides. ITD’s Division of Public Transportation has embarked on an initiative to create Idaho’s first statewide vision and mobility plan for bicycles and pedestrians. The Division of Public Transportation wants to identify the most preferred approach to building a meaningful and viable bicycle and pedestrian environment throughout Idaho, based upon the needs and desires of each community. Sharon Short is helping the state keep its highways clean. 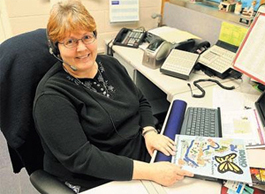 Short, a front desk worker at the regional Idaho Transportation Department office in Pocatello, spends most of her weekdays talking through a headset and answering phone calls, among other duties. The week of Nov. 3, the Downey/McCammon crew in District Five noticed a yelping sound coming from the south side of the maintenance yard. They commented to each other that it must be a pack of coyote pups looking for their mom.